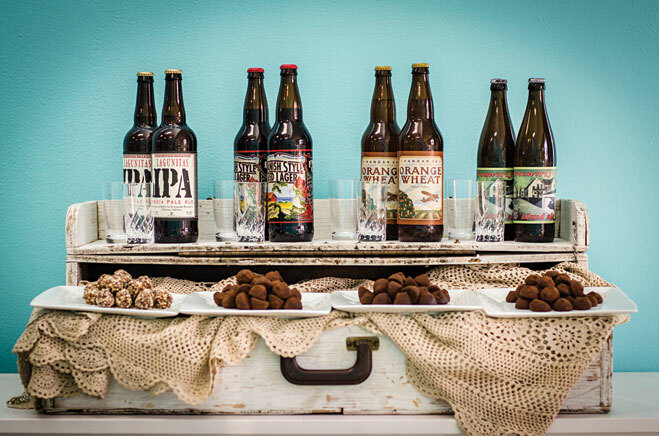 Dessert tables are all the rage, and Meg Hall, the founder of Los Angeles–based catering company Made by Meg, has concocted a fresh idea that will keep both guys and girls happy: a tasting station pairing artisanal chocolate and microbrews. For a wedding last October, Meg played upon the couple’s love of both vices by renting a dark wood bar for the station; servers kept the truffles coming, while guests sipped their chilled microbrews from 4-ounce Japanese beer glasses. But you don’t have to be a seasoned chef to set this up yourself. Pulling off this delightful combo is not only easy, but also fun—especially for those with a sweet tooth. “Google chocolatiers in your city and conduct taste tests,” recommends Meg, who is opening her first storefront in Redondo Beach later this year and is partial to serving delectables from Los Angeles chocolate makers Compartés Chocolatier and Valeries Confections. Once you’ve found your three artisanal truffles (or more—we’re not judging! ), stop by Whole Foods and have its beer experts help you with the pairings. As Meg says, “Chocolate and beer, everyone gets an aphrodisiac. Isn’t that what love is all about?” We couldn’t have said it better ourselves.